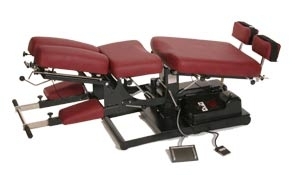 The Flexion-Distraction technique is performed on a special table that helps to separate the thoracic, cervical, and lumbar spinal joints. The doctor makes a gentle contact and flexes the table to induce certain movements in order to decompress the inflamed areas around the spine and restore nerve functioning. Flexion Distraction technique is designed to be a safe, nearly-painless alternative to back surgery, and is commonly used in patients who are still suffering from back pain after extensive surgery, or are in the rehabilitation phase and want to improve their recovery results. The technique is designed to realign the spine by applying pressure in key areas of the back; the chiropractor effectively decompresses the discs by applying a gentle stretch to the lower spine, and a series of repetitive movements and thrusts to reduce pressure. Overall, the Flexion Distraction Technique is used to decompress the spinal column and adjust poorly functioning vertebrae. It is most effective for reducing the effects of degenerative disc diseases and lumbar, cervical and thoracic disc herniations, and offers several benefits for people who do not want to undergo surgery to get rid of back pain. Instrument assisted soft tissue (IAST) mobilization, such as the Graston® and GuaSha technique are methods of manual soft tissue that promote healing in the body. They are non-invasive but allow the doctor to get deeper in the muscle to invoke change while being very sensitive to patient tolerance to the procedure. They work by breaking down scar tissue and fascial restrictions in the body to promote proper distribution and direction of fibers in the body. As we do repetitive motions throughout the day micro-trauma can occur in the muscles and surrounding fascia being used. This leads to adhesions or restrictions of movement in the muscle or fascia itself. Over time, this leads to pain in the muscle and surrounding fascia which in turn leads to restricted movement in the part of the body affected. Decreased function and overall, decreased quality of life are the outcomes of this. By breaking up the fascial restrictions and adhesions, the muscle and fascia are able to move freely, leading to decreased pain and increased function. Nutritional deficiencies rob the body of its own natural resources and can manifest as symptoms such as fatigue, mood swings, and insomnia. Many times, these symptoms are taken for granted as a natural sign of aging. When left unchecked, however, these same deficiencies can contribute to diseases such as arteriosclerosis, high blood pressure, diabetes, and arthritis. Our Doctors specialize in the use of nutritional supplements to treat and co-manage many common disorders. Stretching and an active lifestyle are highly recommended to help reduce back pain and speed the recovery process following an injury. Improving flexibility through stretching is also an excellent way to avoid future injuries. Depending upon your individual injury and level of pain, the exercise and rehabilitation program may vary. The key is to start slowly and increase the repetitions as you feel stronger and have less pain. We will develop an individualized program and provide instruction on proper stretching and strengthening techniques. Our idea with rehab is to provide a low tech, but highly effective approach. All of our stretches or strengthening exercises can be done in your home at a convenient time for your busy schedule. We don’t give you hours of rehab to do; in fact most of our stretching and strengthening programs take only 15-20 minutes/day. The latest research supports the use of rehabilitative exercises much sooner in treatment than previously thought. We begin with nice and easy stretching methods as soon as the patient can tolerate them and move into more aggressive strengthening moves as soon as the patient is ready. We focus on true core strength which has been shown in multiple studies to not only help alleviate current low back pain but to also to decrease the chance of re-occurrence of your low back issues. While we can’t guarantee results, this systematic approach to care tends to have true long lasting results for patients. Adjustments result in easier pregnancy, significantly decreased mean labor time, and assists new mothers back to prepartum health. 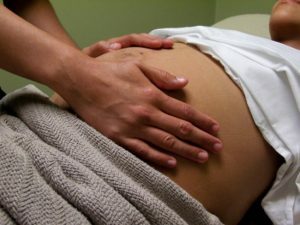 In one study, women receiving chiropractic care through their first pregnancy had 24% shorter labor times than the group not receiving chiropractic, and multiparous subjects reported 39% shorter labor times. In addition, 84% of women report relief of back pain during pregnancy with chiropractic care. Our doctors are trained in prenatal nutritional therapies as well. During pregnancy the body requires more of many common vitamins and minerals in order to ensure proper development of the fetus and optimal health of the mother. We can also make recommendations of the right kinds of foods and exercise during pregnancy to provide the best possible environment for you and your baby. One of the best treatments available includes Chiropractic adjustments, rehab and custom orthotics. Once your doctor corrects your spine, custom orthotics will help balance your feet and support good posture. 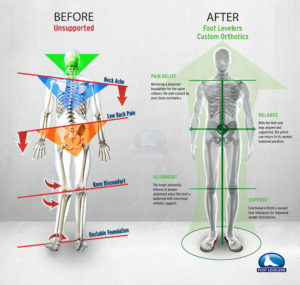 Foot Levelers Stabilizing Orthotics are designed to treat the body as a single functioning unit, starting with the feet. If you suffer from low back pain, plantar fasciitis, knee pain, hip pain, or even neck pain, Foot Levelers Stabilizing Orthotics can help.